General Register Office births, marriages and deaths are a fantastic resource covering the entirety of England and Wales between 1837 and 2007. They not only allow you to discover when and where your ancestors were born, got married and spent their final moments, but also provide you with the information needed to order a copy of an original certificate from the General Register Office of England and Wales. 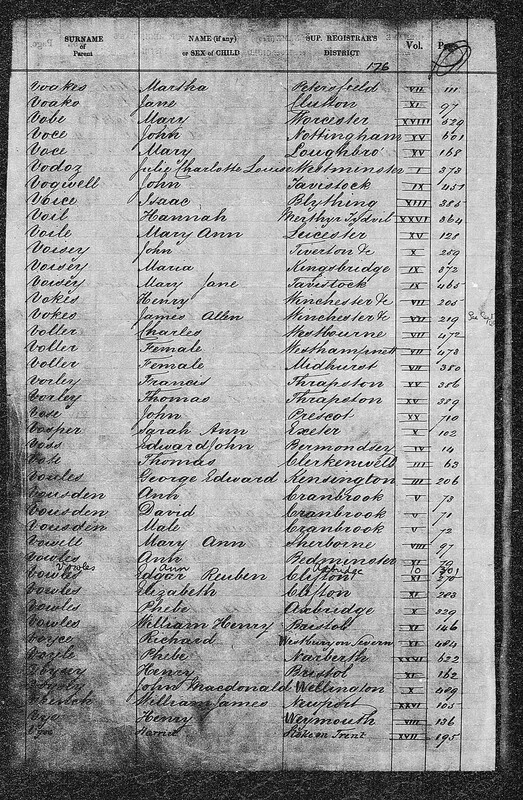 Despite the fact they are perhaps the most complete source of UK vital records available online, there are a number of reasons why your ancestor may appear to be missing from the registers. Indexes to the civil registers of birth are virtually complete from July 1837 onwards. However despite the threat of fines, registration was not made mandatory until 1875. Up until then, there was actually under-registration due to a variety of factors including a lack of public awareness of the requirement, indifference, wariness of authority, non-compliance and transient family lifestyles, for example. In addition to this, there is an inevitable small-percentage loss of actually recorded events due to clerical error e.g. when copying an entry from the original district register of births into the quarterly copy prepared for the General Register Office, or accidentally turning two pages instead of one and missing out an entire spread of entries, or perhaps loss of entire registers in transit between the district level and the central office. There are also more contemporary hazards – for example, pages inadvertently not microfilmed and, therefore, not digitised for the online versions with which most of us are familiar with these days, and entries that transcribers have mis-indexed. Estimates of under-registration of birth vary, and perhaps can be exaggerated – the level will always be uncertain and unknowable. Even if the level never topped, say, 7%, this would still represent a lot of missing births and potential genealogical brick walls. In the very earliest years, to maybe the mid-1840s, comparing the civil registers with parish registers reveals that some entries in the latter do not appear in the former. The reverse is also true of course, because the parish registers of the established church by their very nature exclude Catholics, Non-Conformists, Jews and others. For certain districts, one sometimes also notices an unusually high number of entries indexed as 'male' or 'female' in the civil births (i.e. unnamed at registration) which bear names in the parish registers (i.e. because the child is baptised and christened). Don't forget to consider these, just in case (they don't necessarily denote an infant death). There are other reasons why you might not be able to find the birth: they may have been born outside of England & Wales (e.g. Ireland, Scotland, or Isle of Man); they may have been registered under a variant of the name you have; they may have been born illegitimately and their birth registered under the mother's name; or they may have been born legitimately, lost their father to premature death and taken the surname of a step-father after a remarriage of their mother; or they may have been informally fostered and taken the name of the family in whose care he was placed.